Is your company ready for XBRL? Learn more about XBRL and its benefits for financial and corporate reports. Why do we file documents with the SEC (U.S. Securities and Exchange Commissions)? Foreign companies that issue ADR – American Depositary Receipts (companies that are not headquartered in the United States and issue share receipts to trade securities in the U.S. Market) should provide financial information through filings with a foreign stock exchange. XBRL is an extensible markup language (XML) that allows greater reporting accuracy and efficiency by tagging the reports using the required taxonomy applicable to the company. Created by the American Institute of Certified Public Accountants (CPA), XBRL (Extensible Business Reporting Language) is the standard language for reporting financial data because it allows accounting information to be reused along with other types of financial data available on the internet. The U.S. Securities and Exchange Commission (SEC) uses the Electronic Data Gathering, Analysis and Retrieval (EDGAR) program to store all XBRL filings submitted by companies listed in the United States. What challenges do we face today? Lack of transparency in internal and external reporting processes. 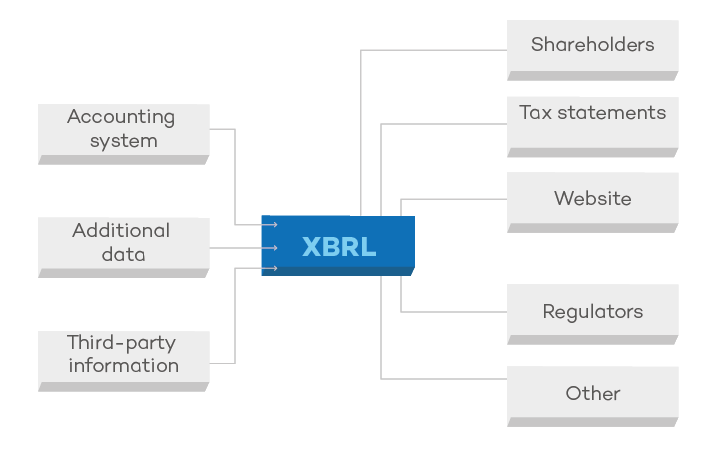 What are the advantages of using XBRL? It benefits stock exchanges, improving financial information efficiency and transforming this information into analytical applications. It provides important benefits for regulators and government through a reduction in information volume and ensures data accuracy. The main risks of using XBRL include i) choosing the wrong taxonomy tags (it is necessary to accurately map tags in order to ensure data reliability); ii) creating unnecessary extensions, i.e. new extensions to cover information that already exists in the taxonomy (lack of taxonomy knowledge may lead to the creation of extensions for line items already covered by the taxonomy); and iii) missing deadlines for XBRL filings, as when filers fail to meet the deadline, the filing will be deemed not current with their Exchange Act reports and, as a result, will not be eligible to use the short Form S-3, F-3, or S-8, or elect under Form S-4 or F-4 to provide information at a level prescribed by Form S-3 or F-3. By using the right taxonomy tags, companies are able to easily, quickly and accurately compare their own data over time, as well as with their peers. XBRL has its own calculation linkbase, so it helps filers know for sure that calculations in the document are accurate. It also helps promoting consistency and reporting quality. MZ was the first company in Brazil to file an XBRL document in 2010. Our team has deep knowledge of IFRS Taxonomy and can easily and accurately convert your financial statements to XBRL. MZ will do all the work for you and simply handle you the final file for revision. We look forward to helping you in this process!